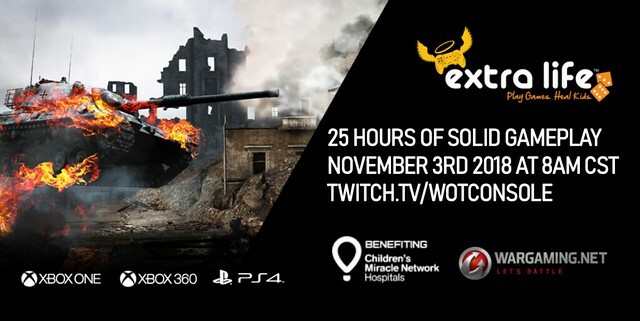 Join Wargaming During Their Extra Life Marathon Charity Stream This Weekend! This weekend, the Wargaming Chicago-Baltimore development team is streaming for a mighty cause, and viewers can earn awesome in-game prizes for tuning in! Starting on Saturday, November 3 at 9:00 AM EDT / 8:00 AM CT/ 6:00 AM PDT and running until Sunday, November 4 9:00 AM EDT / 8:00 AM CT/ 6:00 AM PDT, the team will stream World of Tanks: Mercenaries — available for PlayStation 4 and Xbox One — for a solid 25 hours as part of the Extra Life Charity Marathon to raise awareness and charitable donations for local Children’s Miracle Network hospitals. You are invited to watch the stream on their official World of Tanks Console Twitch Channel, participate in some fantastic stream activities and giveaways, and help them achieve their goal of raising $5,000 for this amazing cause! While the team engages in battle, they have some great activities planned. Throughout the stream, you’ll be able to catch live Q&As and World of TanksConsole developer interviews with the Wargaming staff, as well as Twitch chat challenges, game events, and so much more! You’ll also be privy to some fantastic tank giveaways, such as the Atomic Centurion, the Warlord Panther, Trinity Mk II, and more, along with Premium time packages and World of Tanks: Mercenaries t-shirts! Want to join in on the fun? Just tune in to the stream – throughout it, you’ll be able to participate in the limited-time bounty event. Destroy one of the Gold-camouflaged Bounty Tanks controlled by Wargaming Staff and community contributors from around the world, and instantly earn a x5 XP Boost, one large First Aid kit, and one x2 XP Boost!